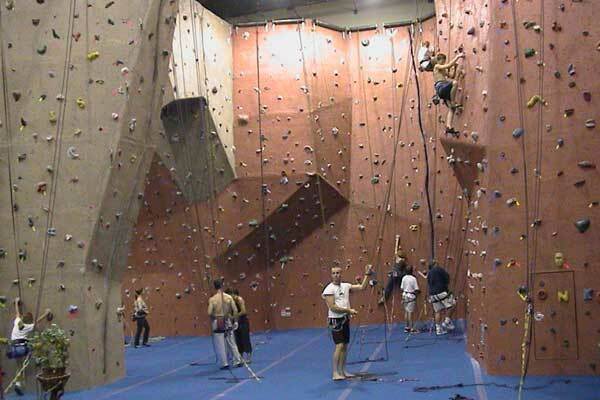 Therapeutic climbing, in which patients are led in rock-climbing programs (usually on indoor climbing walls), is growing in popularity. Previous research indicated that therapeutic climbing may be beneficial for people with Autism. Now new research suggests it may be as effective, or more so, as standard exercises for back pain. The study included 28 individuals with chronic low back pain (CLBP). Over a four-week period they participated in either a standard exercise regime for back pain or in a therapeutic climbing program. Each program involved four guided training sessions per week. Before and after the intervention subjects completed the Hannover Functional Ability Questionnaire for measuring back pain-related disability (FFbH-R) and the 36-Item Short Form Health Survey (SF-36). No significant changes were seen on FFbH-R scores. However, both the exercise group and the climbing group showed significant improvement on SF-36 scores. "The benefits of therapeutic climbing were comparable with those of a standard exercise regime," conclude the study's authors. "In two subscales of the SF-36, the benefits of therapeutic climbing exceeded those of standard exercise therapy, primarily in perceived health and physical functioning of the patients. This finding demonstrates that therapeutic climbing is equivalent and partly superior to standard exercise therapy for patients with chronic low back pain." Spine - May 15, 2011;36:842-49. There's good news for parents of colicky babies. More research is showing that Chiropractic care is beneficial for babies with colic. An extensive review of the current literature showed that "that chiropractic care is a viable alternative to the care of infantile colic." One hundred and thirty thousand years ago, when residents of the planet possessed complete Neanderthalic characteristics, posture wasn't really that high on the list of health priorities, to say the least At the time, we assume finding food, surviving the seasons and avoiding death by all manner of creatures were considerably more important. But this is 2011 and we can stand upright, walk upright and consider our health a precious asset. And yet, like the Neanderthals, our apparent disinterest in good posture remains. For tips on the best ways to perfect your posture, look no further than Straighten Up America, a health promotion initiative developed in 2005 with a vision: to educate the public about the importance of good posture and spinal health, to the point that "every American will take two or three minutes every day to care for their spinal health, just as they care for their dental health." Straighten Up, which partners in promoting the nation's health with the President's Council on Physical Fitness and Sports, is designed to get children and adults up and moving while they improve their posture and spinal health. The Straighten Up program also includes healthy lifestyle recommendations congruent with the goals and objectives of Healthy People 2010, America on the Move, Steps to a Healthier US and the 5 A Day programs. Check out Straighten Up America for handouts on improving your posture. Anyone who has experienced foot problems understands all too well that it can affect the rest of the body. The feet are your foundation, much like the foundation of a house. If that foundation suffers, the entire structure suffers right along with it; in some cases, it can come crashing down. Fortunately, that same logic applies in reverse: optimizing foot performance and health is like strengthening your foundation; the result can be a stronger, more durable you from the ground up. The takeaway here seems clear: Support your feet and your feet will support you. An increasing body of research suggests foot orthotics can positively impact foot health (and thus whole-body health) in numerous ways. Talk to us to learn more. For many years, Chiropractors have observed that patients experience improvements of complaints related to immune problems such as: the disappearance or lessening of allergy symptoms, quicker recovery from or less frequent and severe colds and other respiratory infections. An article in Dynamic Chiropractic describes in detail that studies have shown that Chiropractic adjustments boost T cell counts by 48% (T cells help kill infections), and reduce inflammation, resulting in decreased pain and swelling. What results have you experienced? Do someone a favor and share your experience with them. Conventional produce these days is sprayed with a host of pesticides, insecticides, and herbicides all of which are extremely neurotoxic. Approximately 3 million tons of pesticides are used each year worldwide, made from over 1,600 chemicals all designed to kill insects, rodents and weeds, so obviously they are poison to your body as well. The challenge continues to increase as this chemical industry progresses.In order to create chemicals that don’t wash off with rain and that can better withstand pests, these toxins become more difficult to avoid, further penetrate the food, become virtually impossible to “wash off,” and altogether are more harmful to the body. Can You Afford Not To Stay Healthy? Did you know that medical bills prompt more than 60% of US bankruptcies? With the increased costs of medical care, can you afford to be sick and un healthy? Life style choices such as eating a diet rich in a variety of fruits and vegetables, and limiting refined sugar can have a dramatic affect on your health. Chiropractic care can literally save you thousands in keeping you in tip-top shape. Not only do you use medicine in a limited and responsible manner, but you don't take as much time off work. So stay committed to your Chiropractic care and a healthy lifestyle. Just like everything in life, taking small daily 'healthy' steps will pay off in the long run.